[The land] consisted of the Timber Yard of Messrs. Curme & Monday, with one or two houses facing the street. … Public advertisements were issued for a suitable design, which resulted in the premium being awarded to Mr. Malpas, of Frome. 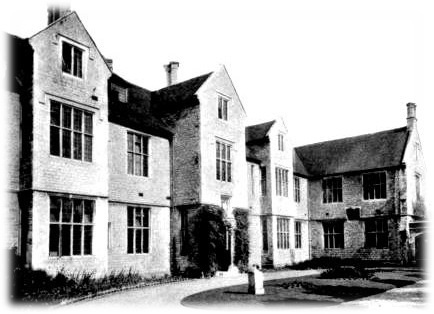 But his plans were not finally utilised, as Mr. Ferrey of London, suggested a more economical arrangement, by means of which the houses already referred to as standing on the chosen site were to be adapted for the use of the House Surgeon, Matron and Nurses, and to be connected by a covered passage with … the North Wing . The architect, Benjamin Ferrey (1810–80), was the youngest son of another Benjamin Ferrey, a draper who became Mayor of Christchurch. Benjamin junior was educated at Wimborne Grammar School, and afterwards studied under Augustus Charles Pugin. In his early twenties Ferrey toured continental Europe, then studied under William Wilkins. He started his own architectural practice in 1834, in Great Russell Street, Bloomsbury, London. Some of his earliest work was in the design of the new seaside resort of Bournemouth. His other Dorset commissions included All Saints’, High East Street, Dorchester (1843–5), the Town Hall in Dorchester (1847–8), and Holy Trinity, in High West Street (1875–6). Ferrey was honorary architect to the Diocese of Bath and Wells from 1841, responsible for much of the restoration work on Wells Cathedral. He was twice vice-president of the Royal Institute of British Architects and in 1870 was awarded a Royal Gold Medal . 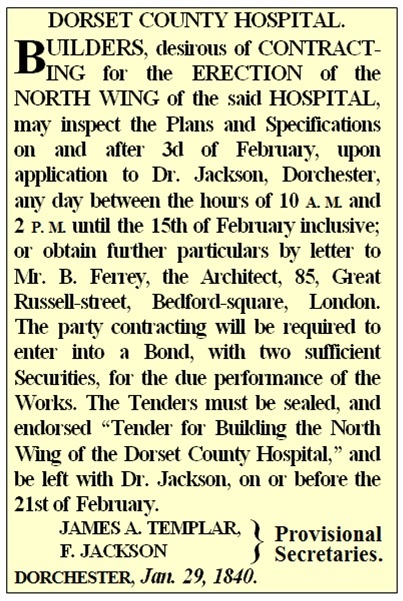 The building contract for the hospital was advertised in the local press in February 1840 . The contract for the North Wing was signed with Messrs. G. W. Slade, for the sum of £1,188, and he completed the building works in March, 1841. In 1844, the Earl of Shaftesbury donated “a considerable strip of land, and house upon it, immediately in front of the Hospital”, and in November 1845 nearly the whole of the central part of the building was completed, at a cost of about £3,500. The contractor was Mr. Goddard of Bridport, working under the direction of Ferrey. The extension consisted of five more wards and housing for all the resident staff (so that the old cottages were no longer necessary). In 1856 George Bankes, one of the local members of Parliament, died, leaving a bequest of £500 to the hospital. His widow undertook to double the amount on condition that it be used to build the South Wing, to be called the Bankes Wing. The contract was given to Mr. Wellspring, of Dorchester, and the building was completed in 1859 at a cost of about £1,600. This part of the hospital housed the convalescent wards or, when painting and cleaning was carried out in other parts of the estate, it was used to accommodate twenty or thirty patients. 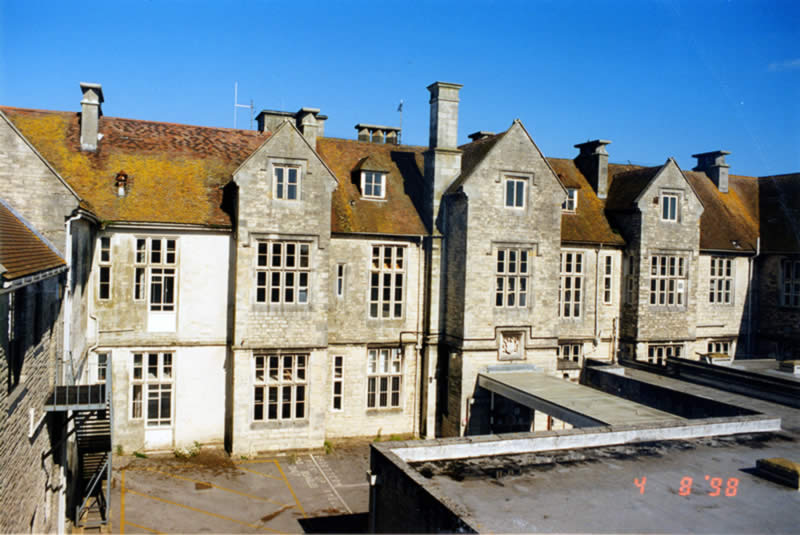 The Bankes Wing was part of Ferrey’s original design and so, nearly twenty years after the first foundations were laid, the three main parts of Ferrey’s building were completed, at a total cost of about £6,300. In 1846, A. H. D. Acland, the first chairman of the management committee, presented the hospital with a sun dial. Two years later, in 1848, he donated a small wooden chapel which had previously been attached to his house in Dorchester (up until then, a room in the hospital had been used as a chapel). In 1862, the wooden chapel was replaced by a permanent one (built by Mr. Wellspring, again from the original designs by Ferrey). This permanent chapel was wholly financed by Mr. Acland’s relative, Robert Williams Junior, son of the original land donor. The new chapel was dedicated on 9 April 1862 by the Bishop of the Diocese. In around 1878, an annex was attached to the North Wing, providing more space as well as accommodation for the nurses in charge of the wards. In 1885, a porter’s lodge was built (the date here provided by Pevsner , confirmed by the census returns; Acland states the lodge was built in 1868). 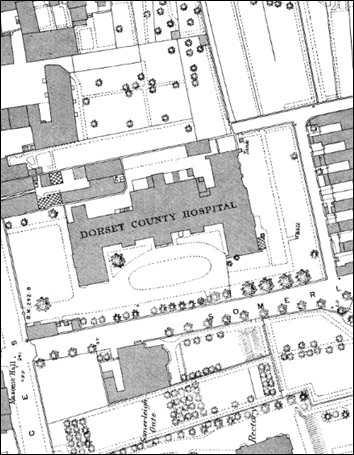 Other improvements were made in the period 1893-96 including re-laying the entire drainage system, installing hot water pipes in the corridors and wards, laying wooden block flooring in the lower passages, re-building defective chimney stacks, repairing the roof, supplying new furniture to the matron’s and nurses’ rooms, and introducing electric bells to the wards. In 1898, Charles Hansford, one of the vice-patrons of the hospital, paid for a sheltered alcove adjoining the South Wing. In 1899 the accommodation for out-patients was improved, with a new, dedicated entrance and a re-arrangement of the rooms used for the surgery, dispensary, and waiting room. In 1901, a complete system of fire hydrants was installed, a special water main being laid from Princes Street, through the back yard, and up to the second floor of the building. The original operating room was located at the very top of the building, meaning that patients had to be carried up and down several flights of stairs. In 1903, a new operating room – located in a central position – was opened by Sir Frederick Treves. Treves was an eminent Royal surgeon and had performed a pioneering appendix operation on the hospital’s patron, King Edward VII, in 1901 . By 1911, the main hospital building had 37 rooms, and the porter’s lodge consisted of four . In 1926, a further annexe (containing eight small wards) was added on the south side , and the following year a new ophthalmic ward was presented to the hospital as a memorial to William Watkins, who was for many years honorary secretary of the Society of Dorset Men in London . In 1948 the hospital became part of the National Health Service and a number of specialist hospital and service buildings were added, mainly from the 1960s. In 1975, the main block became a Grade II listed building . By the time the hospital closed in 1998, the 7-acre site contained a total of 27 buildings dating from 1840 to the 1980s. After the closure, Keystone Historic Buildings Consultancy carried out an historic impact assessment of the proposed conversion of the buildings to domestic accommodation . The main building was converted, and re-opened as a private apartment block called ‘Benjamin Ferrey House’. Acland, J. E., A Short History of the Dorset County Hospital, 1902, pages 6-7. Information has been taken from this history unless stated otherwise. Newman, J. and Pevsner, N., The Buildings of England: Dorset, 1972, page 183. 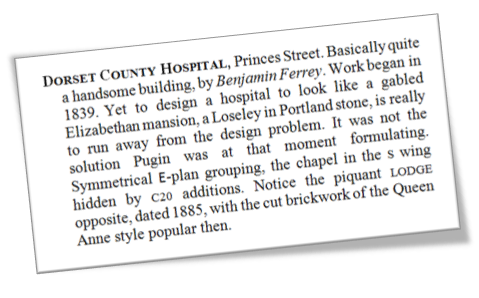 Kelly’s Directory, 1927, page 83.
 www.britishlistedbuildings.co.uk [accessed 4 Feb 2014]. www.keystone-historic-buildings.com [accessed 4 Feb 2014]. I am grateful to Keystone for permission to use one of their photographs.